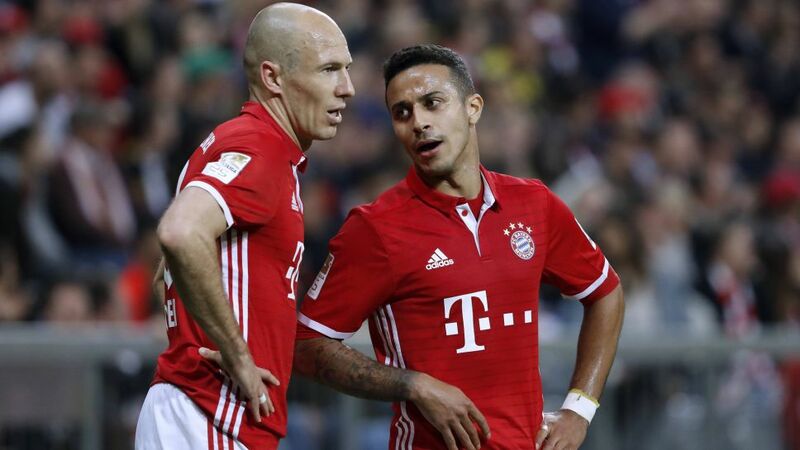 Arjen Robben (l.) and Thiago (r.) both put in superb performances when Bayern beat Dortmund earlier this month. After exchanging wins in the Bundesliga this season, Bayern Munich and Borussia Dortmund go head-to-head for another Klassiker showdown in the semi-finals of the DFB Cup on Wednesday evening (kick-off: 20:45 CEST/ 18:45 GMT). Bayern will be without Manuel Neuer after the Germany's, and indeed the world’s, number one goalkeeper broke his foot in the recent Champions League loss to Real Madrid. Sven Ulreich will continue to deputise, with Carlo Ancelotti expected to name an otherwise full-strength side. After the recent 4-1 loss in the league, in which Arjen Robben ran rampant, Thomas Tuchel is likely to put Erik Durm or Raphael Gurreiro at left-back in place of Marcel Schmelzer. The returning Marco Reus will pick up the captain’s armband, with Ousmane Dembele and Pierre-Emerick Aubameyang his likely company in the final third. Aubameyang is the top scorer in the Bundesliga this season with 27 goals, one more than Bayer’s Robert Lewandowski. In the DFB Cup this term, the Poland captain has scored five, with his Gabon counterpart yet to open his account. Bayern and Dortmund have met three times this season. Bayern won the Supercup 2-0 in August; Dortmund took the spoils with a 1-0 at the SIGNAL IDUNA PARK in the league in November; whilst Bayern won the most recent clash between the side 4-1 at the Allianz Arena earlier this month.Bayern are undefeated in their last 27 DFB Cup matches; Dortmund have not tasted cup defeat in 10 games. The Bavarians have won this competition a record 18 times. BVB have been cup holders on three occasions – most recently in 2012 when they beat Bayern 5-2 in the final.